Mac is a versatile ‘Graphical User Interface’ based OS by Apple that also supports Windows and it’s few applications. The interconnectivity and compatibility that goes hand in hand make us jump in with both of our feet in Mac Development. Sometimes the most simple thing is the most powerful one as is the case with Mac OS for it allows the data to be easily shared, synced and kept safe. We have developed apps for all Apple versions (workstations or servers). Our Mac OS app development services are ranging from:Custom Business Software Custom Business workflows, Custom Mac Utilities, B2C Mac apps, Mac Travel Development, Mac Education Development, Mac Game Development, Mac Healthcare Development, Mac Enterprise Development, Retail Software, Mac Business Tools, Social Networking, Mac Entertainment Development, Travel & Navigation, mCommerce, Mac News Development, Mac Lifestyle Development. We pay special attention to Mac OS Development for startups and emerging companies. 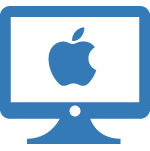 Our team does Mac programming for all the versions of MAC OS X including Mavericks, Snow Leopard, Leopard, Tiger, Panther and Jaguar. The dedication and experience are crafted and merged to bring you the adeptness in dual programming and can port PowerPC binaries to Universal architectures, perform WebKit programming and can develop plugins for Spotlight. with End-to-End Mac OS app development services. We craft our esoteric logical approach pertaining to the customized & personalized need requested by our valuable clients. Keeping top-notch quality parameters for years has turned into a habit now and hence, we absolutely like to lend our ears to shape your business plan/idea into reality apps that offer exceedingly well usability and great potential for your business processes. You can expect fully integrated and innovative Mac OS app development proposals from Moon Technolabs. Our attention is to encapsulate on the various & feature-rich Mac OS platform to exponentially expand your presence to global targeted market and respective industry audience.